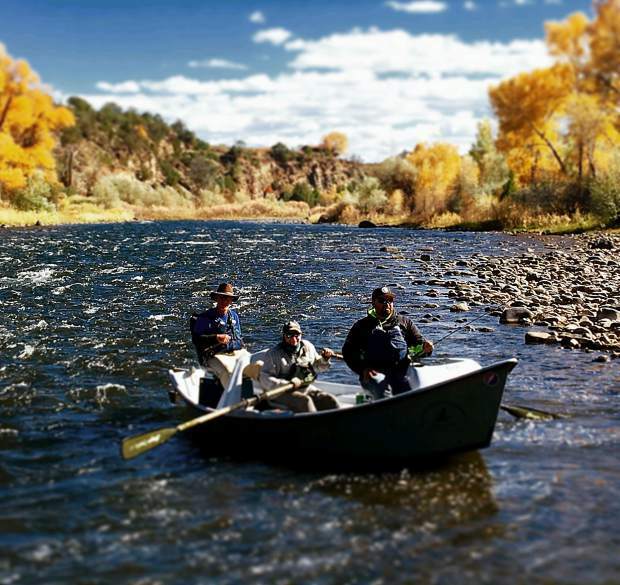 Kyle Holt and two clients float along the Roaring Fork. Now that we have some snowfall under our belts here in the Roaring Fork Valley, the fishing will begin to change yet again. The fish are noticing these annual cycles and their feeding patterns, behaviors and diets are starting to adjust. So must we as fly fishers. Over the next month we should still enjoy the prolific late-summer hatches of the Roaring Fork Valley (especially up the Fryingpan River), but those epic days are numbered and we need to take advantage while we still can. Flows are going to be dropping soon, and we need to consider stealth and accuracy to remain successful. Simply put, these fish have literally seen thousands of flies over the past few months, and with slower and clearer water on the way the trout have plenty of time to inspect our fly and choose whether to accept it. The opposite argument also can be made here, as trout sense the lean and dark times on the horizon and start to feel a sense of urgency in regard to their caloric intake. This is the reason we have such incredible streamer fishing here in the fall, as is the case anywhere trout reside. Large meals take a higher priority than chasing down tiny flies, especially for bigger trout. October and November are magical around here. This is the time to experience fewer people, vibrant colors and late-summer hatches that will keep on rolling for another week or so, thank goodness!